Probably the biggest news so far this year for collectors of "little rubber guys" is that an official, large scale release of Masters of the Universe mini figures is finally here! Aside from a couple limited foreign sets and some capsule machine knockoffs, we had surprisingly never seen monochromatic minis tied to this iconic '80s franchise. That's no longer the case, thanks to a new toy line from Super7. 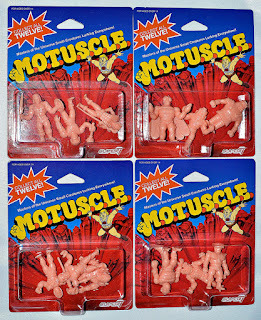 The line is called MOTUSCLE, since these figures are meant to be an official continuation of Mattel's MUSCLE figures from the '80s. 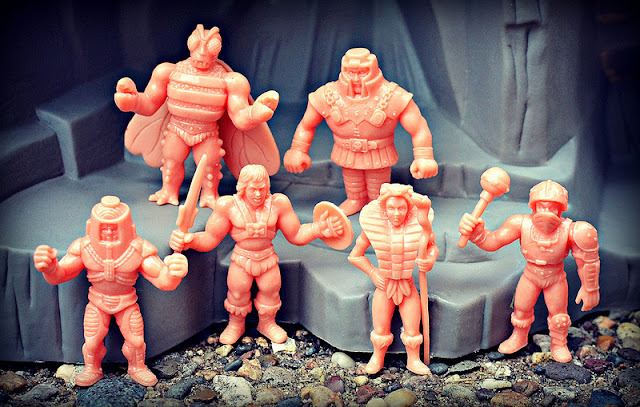 Super7--the company behind collector-focused toys like the ReAction line of vintage-styled action figures--actually secured both the MUSCLE and Masters of the Universe licenses from Mattel and worked with them to bring these figures to life. MOTU is the first of multiple properties that are planned to take mini figure form under the MUSCLE name--Alien and Robotech figures are already in the works. The news of MOTUSCLE came on suddenly, shortly before San Diego Comic-Con 2015, where they debuted earlier this month. 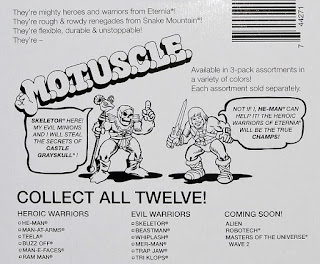 At the convention, Super7 offered these figures for the first time in a few different ways: three-packs in a classic, MUSCLE-inspired flesh color, three-packs in black, and the Skeletor figure in purple as a giveaway (both the black figures and the purple Skeletor were SDCC exclusives). Series 1 consists of 12 different figures--six "Heroic Warriors" and six "Evil Warriors" from Eternia. The figures come in three-pack assortments as listed below. The package artwork is very much reminiscent of vintage MUSCLE packaging, which definitely amps up the nostalgia factor. The figures measure between 1.5 and 2 inches tall, comparable to vintage MUSCLE and Monster in My Pocket. Even though these are supposed to be new MUSCLEs, the material of the figures is noticeably different. 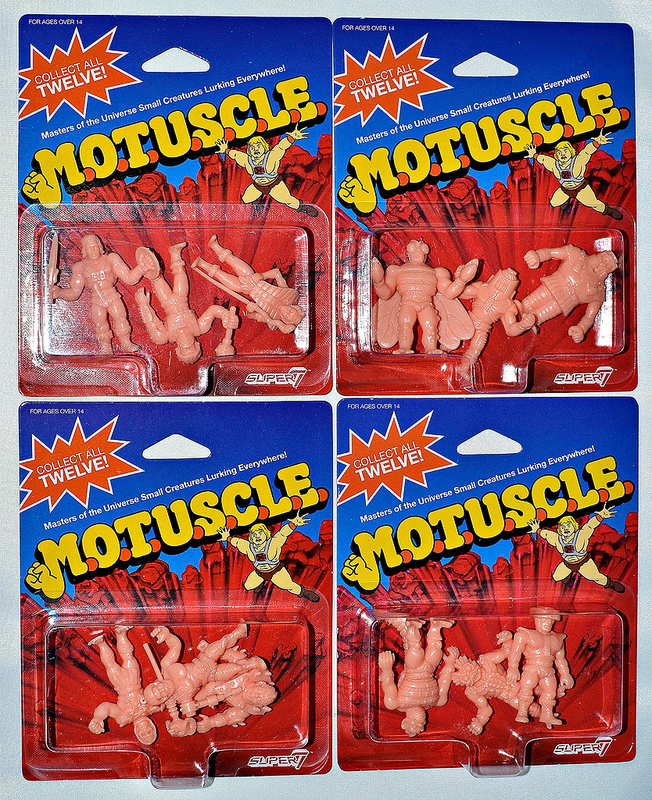 MOTUSCLE are softer and more rubbery than the firmer plastic of vintage MUSCLE figures. 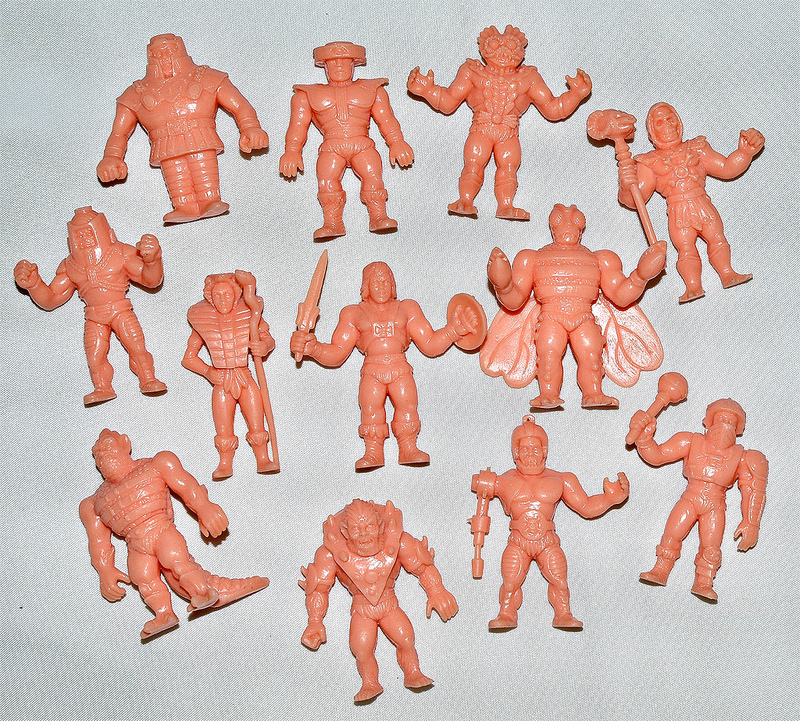 They fall somewhere between MUSCLE plastic and Garbage Pail Kids Minikins soft rubber, leaning more toward the latter. I can see why some collectors might be disappointed that they're not an exact match to vintage MUSCLE plastic, but I personally really like the rubbery feel they have. The flesh color is not an exact match to vintage MUSCLE pink/flesh. It's a bit lighter, but in the same vein. The color of the purple SDCC Skeletor is a close match to vintage MUSCLE purple. The black of the SDCC exclusives is a new MUSCLE color, never found in the vintage releases. The back of the packages says "Available in 3-pack assortments in a variety of colors," but specific additional colors haven't been announced yet. I'm hoping for some neon colors (pink, green, orange, etc.--bring 'em on!). So far, MOTUSCLE have only been sold at SDCC, but an upcoming full/online release is planned for a still-to-be-determined date. The six HEROIC WARRIORS offer up a nice selection of characters, with some MOTU mainstays you'd expect to see in first series of any MOTU line (He-Man, Teela, Man-at-Arms). The stocky Ram Man and bulky, winged Buzz Off provide some nice size variation to the slimness of the other characters. All the sculpts are well done and nicely detailed. He-Man himself probably leaves the most to be desired, but is still decent. Villains almost always have the most fun sculpts, and the EVIL WARRIORS of MOTUSCLE are no exception. The main baddie himself, Skeletor, looks great (especially in purple). The other highlights from the evil guys are Whiplash (awesome texture on this one), Mer-Man (look at that gnarly face sculpt!) and Beastman (nice proportions and again, really cool work on the face). The only negative I can point out with is that Trap Jaw's robotic arm looks kind of puny--he'd look better and more imposing if that arm were beefed up a bit. Very little to gripe about, though! I'm very pleased with these figures, and couldn't be happier that MUSCLE are back after all these years in this new form! 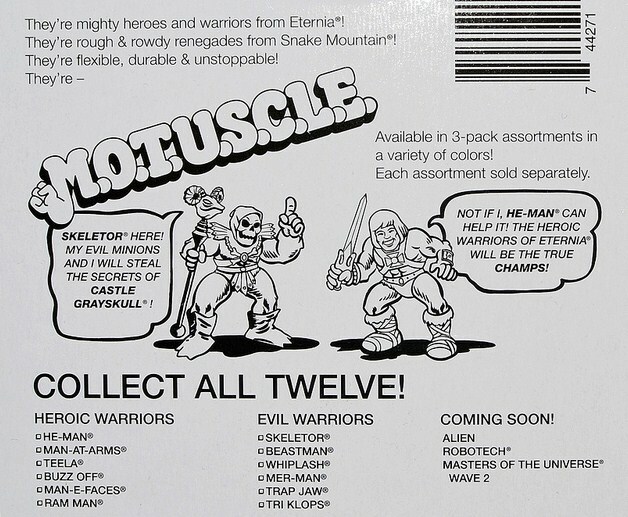 Series 2 of the MOTU-themed line is already planned, and I can't wait to find out which characters are included. What about you? 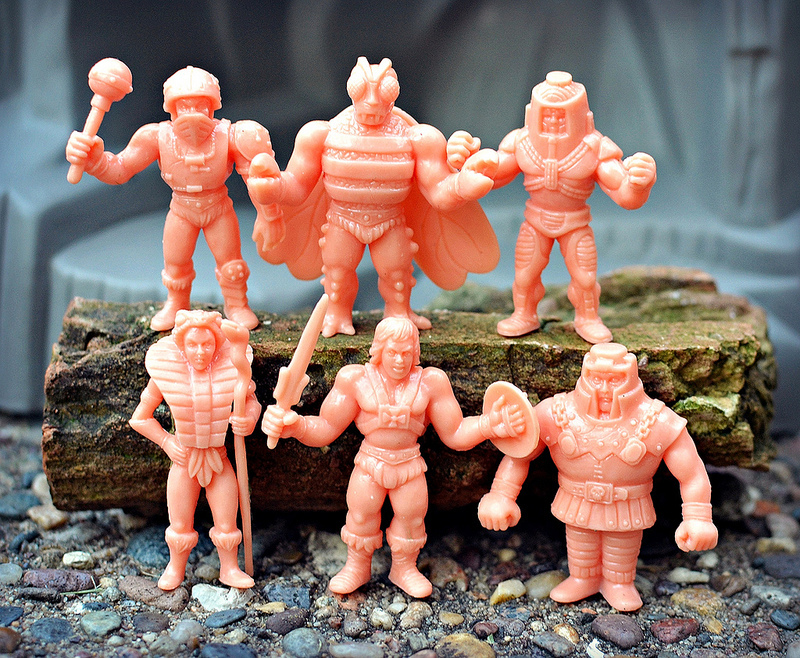 What do you think of MOTUSCLE, and which other franchises would you like to see get mini figure treatment from Super7? They look great! I was a little young for MUSCLE and I have never had any great love for MOTU...but I can nonetheless see myself coughing up the $$$ for these! Yeah, and they retail for $6 per pack, so the price isn't bad! They're actually not available in any stores yet. They should at least be available to order online soon, although no specific date has been given. I only thought they were for the comic con till i was in my local newbury comics. I found mine there for 9.99 i got 3 of the 4 packs. 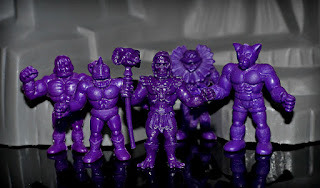 Only certain ones were limited to the con, like the black ones and the purple Skeletor. The flesh ones were being sold online in the Super7 store for a little while. They're going to be coming out with cans full of different colored ones too.